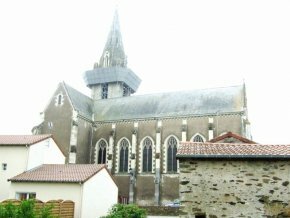 In November 2006, we spoke out against the demolition of the church in Saint-Georges-des Gardes, in Maine-et-Loire, (see French article in La Tribune de l’Art). An article in Le Figaro May 18, 2007 informs us that two other religious buildings are to be destroyed just a few kilometres away from the village, or rather, not destroyed, but "deconstructed", in the new vocabulary made up for the occasion by unseemly elected officials to hide the seriousness of their acts . We travelled there to try and understand what is going on in Mauges, a small area of Anjou which is in danger, if we are not careful, of being copied in the rest of France. by a tornado in 1978. 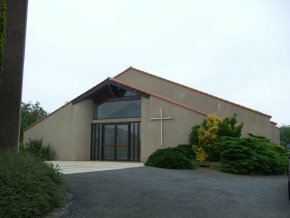 In 1978, a tornado devastated one of the two churches in Le Fief-Sauvin, a village near Saint-George des Gardes. Only the steeple was left standing (ill. 2). The remains of the nave were razed, and a new place of worship, a kind of multi-purpose hall (ill. 3), was built. No doubt thinking that this was not enough, about 1997, the mayor had the second church (for which we have no photos) thrown down, with no help from Mother Nature this time, and a modern building was put up. True, there was more of an aesthetic effort (ill. 4) this time, even if the pictures are flattering : the general lines are somewhat elegant, but the interior reminds one more of a community center. Remains of the choir and stained-glassed windows were preserved, in a mixture of a theatrical and perfectly artificial style (ill.6). This new church, understandably easier to heat in winter and more comfortable, seems to please some of the local population. The crime was committed without anyone taking notice (nothing was said at the time concerning this act of vandalism). This undoubtedly influenced other elected officials elsewhere who wish to rid themselves of their old churches. 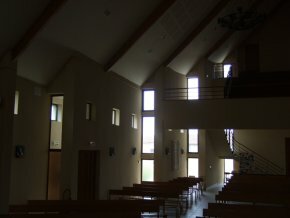 Interior of the parish church built about 1997. View of the remains of the former church. 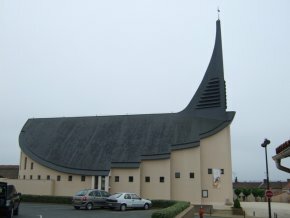 In 2006, next in line was the church in Saint-Georges des Gardes. 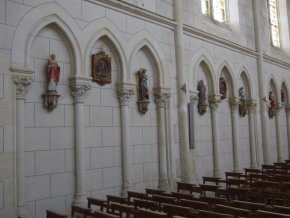 The pretext, to which we will return, is basically the same and identical to the one put forward for Arc-sur-Tille (see articles in French on La Tribune de l’Art about this beautiful church in Bourgogne, also threatened) : estimated cost of restoration and risks posed by the building. At present, two towns wish to add their names to a list that has already become too long : Gesté and Valanjou. 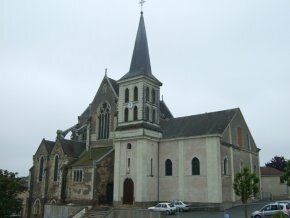 The church of Saint-Pierre-aux-Liens in Gesté (ill. 7 and 8) looks out over the village (ill. 1) and one can rightly affirm that it is the only point of interest and the one most associated with the town. A fire broke out in the church in 1793-1794  but it was partly restored in 1800. It became municipal property in 1814, and in 1844-1854 the nave was built in the Classical style by the architect Ferdinand Lachese. From 1862 to 1864, the choir was reconstructed in the Gothic style by the architect Alfred Tessier. From the exterior, this gives it a composite style, dominated by the choir and the neo-gothic transepts standing on the crypt (ill.9). The condition of the structure does not seem to be in danger in any way, especially given the fact that the pillars inside are of granite. On the other hand, it is obvious, and everyone we asked there confirmed it, that the church has not been kept up for many years. Mass is still celebrated there. 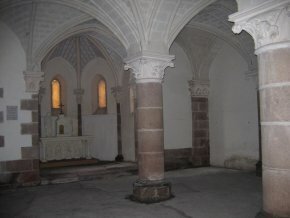 The furnishings are simple, especially due to vandalism which took place iin France after the Vatican II Council in the l960’s, with the disappearance of the pulpit and the altar (this is also the case in Valanjou). 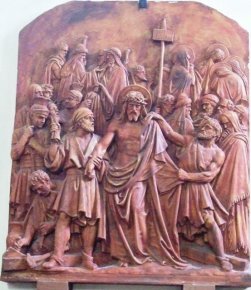 One should notice however a beautiful Way of the Cross in plaster (ill. 10), some stained-glass windows (ill. 11) and sculptures. As in Saint-Georges des Gardes, the antique dealers who will be sure to rush here will not go home empty-handed. The local population seems to be resigned to the event. “We are used to putting up”, stated a retiree, quickly adding, “and any way, they never inform us, we find out everything in the paper”. A former member of the parish council told us he trusted the mayor, even if the news seemed shocking at first. 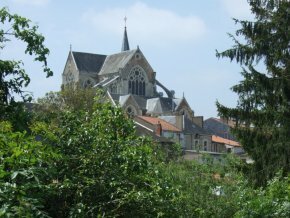 Valanjou was founded from the joining of two villages and today has three parishes, that is to say three churches. It is one of the reasons given by the mayor[We did not try to reach the mayor of Valanjou, but he spoke at length Wednesday May 23 on the program “Bourdin & Co.” on French RMC radio. 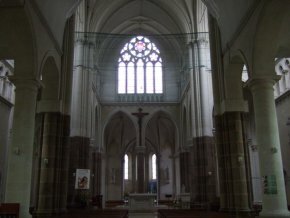 In short, he sincerely regrets the matter but has no choice…]] for justifying the demolition of one of them, Saint-Martin de Joué (ill. 13), designed by Alfred Tessier, the architect of the choir at Gesté . The explanation is obviously unacceptable : let us assume that for administrative purposes you join ten small rural communities into one, would you then maintain only one place of worship ? The steeple lies on a base dating from the XIIIthC. and XVthC., whereas the bellroom and spire, as well as the nave, only go back to the XIXthC. The interior is particularly remarkable thanks to its stained-glass windows (ill. 14) and to a series of small terracotta statues placed along the nave (ill. 15). 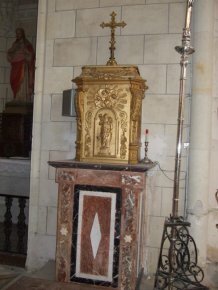 A beautiful tabernacle (ill. 16) was removed to a side chapel after Vatican II, event to which we ascribed earlier the dire consequences suffered by church property. Here also the pulpit has disappeared. In a first stage, the mayor wishes to destroy the XIXthC. part of the steeple, then hopes to raze the nave, keeping only the oldest part of the building. In Valanjou, we were able to speak with Monsieur René Cottenceau, who has founded an association for saving the church. According to the group, whose website can be consulted here, it turns out that the building is in solid shape except for the spire which is at risk. They recommend removing it and keeping the rest of the building, which would seem to be a contradiction in terms. How can one have a church without a spire ? Once again, we find ourselves up against a mayor who states he cannot afford to keep up the church. But if one compares the cost of a total restoration (which no one is asking for), that is 1.5 million euros, and that of the demolition, almost one million euros, it is obvious that the latter is not only absurd, but useless. None of the above reasons for the destructions are acceptable. The demolition and reconstruction of a church cost more than a basic restoration of the existing building. 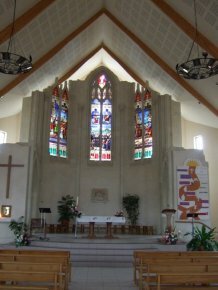 The decrease in church attendance is not an argument either, since in most cases a place of worship has to be rebuilt. The municipalities have been put in charge of church property since 1905. They are therefore responsible for their upkeep although it is not in their self-interest to do so : what difference does it make after all whether the churches are full, or empty ? Destroying, and then rebuilding, provides jobs for local companies…One cannot help but wonder at the attitude of the clergy which seems to be totally indifferent, as long as they are promised a beautiful new multi-purpose building. Thus, the bishop of Angers, whom we contacted but who was not able to answer our questions because he was busy organizing the Pentecost festivities, had written in a press statement released at the time Saint-Georges des Gardes was demolished, that the disappearance of a church was, of course, “always a cause of suffering for the bishop and the Christian community” but that “the town was launching a project to build a chapel at the same location as the church” and that “the demolition of the church did not imply the absence of a place of worship”. That is precisely the problem ! After World War II, we were no longer used to seeing churches in ruins in France. Should we, as does a part of the population, as does a part of the clergy, and it seems, as do many elected officials, resign ourselves to their being razed by bulldozers ? Obviously not. 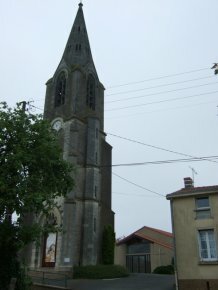 The example of Arc-sur-Tille, whose association for saving the church has made some progress  is a case in point. Solutions do exist. We must resist the trend, fight every inch of the way, alert the media, force the mayors to keep up church property, demand registration of national monuments, raise public awareness, collect private donations, increase fundraising, imagine creative uses for these buildings…If these monuments are destroyed, in the long term, half of France’s churches will disappear. Christine Albanel has just been appointed Minister of Culture. This should be a major challenge for her. Let us hope that she will rise to the occasion. Sophie de Ravine, “Des maires sont contraints de détruire leur église”. This is what the article in Le Figaro implies, saying that the churches destroyed during the French Revolution were of “real architectural value” ! We are indebeted to Alain Guinberteau, creator of the Website “40.000 clochers”, who lives in Cholet and who helped us tremendously in writing this article, for helping us to better understand the ins and outs of this affair. Much of the information was provided by Alain Durand, who lives in Gesté and is firmly opposed to the demolition project. He is a fervent student of the history of Gesté. The postcard in illustration n° 11 is also his. According to the “Base Architecture” of the French Ministry of Culture.